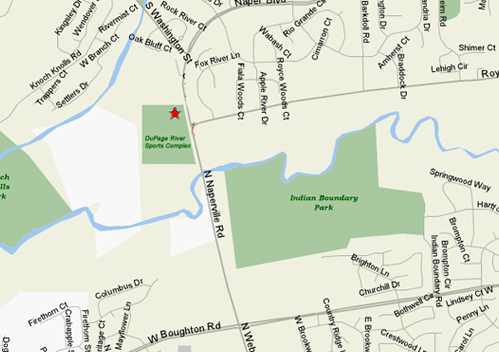 Arrowhead Park is north of Ogden Avenue, South of Diehl Road, east of Washington Street and West of Naperville Road/Naper Blvd. in Naperville. 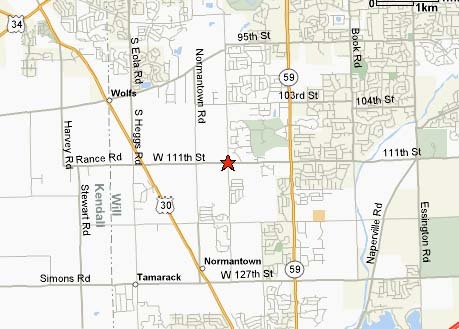 Take Rte 59 S to 75 th Street (East) and turn right (south) on South Washington Street . Park is at the intersection of S. Washington and Royce Road . Take I 55 east to Weber Rd, North (Bolingbrook) Cross over Boughton and turn left at Royce Road. 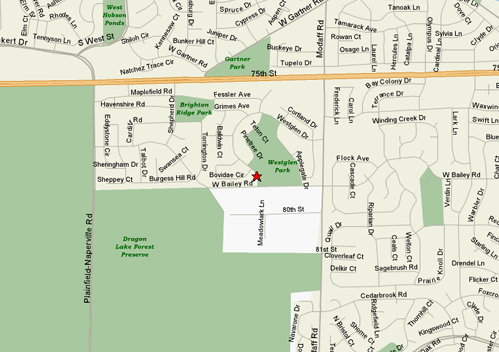 Fort Hill Drive runs North and South from 75th Street to Aurora Avenue in Naperville and is located about 1 miles east of Rt 59. Harris Fawell Park is just north of 75th street and south of Ogden Avenue at 1120 Fort Hill Drive, near Cowlishaw Elementary School. Go South on Rte 59 to 95th St. Go East on 95th St. to Cedar Glade Rd. Go South on Cedar Glade Rd to parking lot. No Smoking, including cigars or pipes, or Alcoholic Beverages. Field is 120 yards by 70 yards. Monarch Park - White Eagle School, Rte. 59 & White Eagle Dr.
Take I-88 to Rte. 59. South on Rte. 59 to 83rd St.
West on 83rd St. to Meadowbrook Dr., 2nd entrance to White Eagle. Turn Right onto WED. Continue to School, 1Ú2 mile on right. No smoking allowed, including cigars, on the sidelines. Take I 88 to Rte 59 South. Take Rte 59 S to 75 th Street (east). Turn right on Shepard Dr.